Presented is an investigation of another popular charting method used in technical analysis of currency price patterns, namely the forex candlestick charting method. The candlestick chart is similar to the popular forex bar chart and line chart. In short, forex candlestick charting allows the user to view a graphical representation of all high, low, open and close price movements over a specific period (normally 24 hours). Candlestick charting appears similar in style to error bars but are not related at all. Candlestick charting is commonly used to identify price movement over a specific time period. Candlestick charts are believed to have been invented by Japanese rice trader Homma Munehisa, in the early 18th century. Homma is believed to have used the candlestick chart as a method of recording open, low, high and close price movements of his rice dynasty over a set period of time. Japanese rice traders of the past relied on the candlestick charts to provide accurate future predictions on price movements and demand. The candlestick chart is still popular today due to the ease in reading and understanding the chart and associated data. Charles Dow was introduced to candlestick charts and in turn introduced it to the west in during the 19th century. Candlestick charts consists of candlestick symbols consisting of a body (black or white in color) and an upper and a lower shadow (referred to the “wick”). The peak and lowest trading price is represented by the wick. The body of the candlestick symbol illustrates the opening and closing price of securities. The body of the candlestick is shown in white, whenever the stock priced closed higher than the opening price. 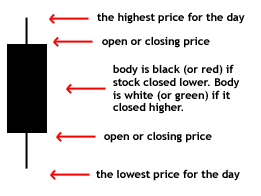 The body is shown in black whenever the stock price closes lower than the opening price. The opening price is entered at the top of the candlestick. Forex candlestick charting is more useful than other forms of charts such as the common forex bar chart. This is based on the added information that is displayed by the candlestick chart. They are visually simpler to read and analyze with the added benefit of the indicated previous price values. FX trading Candlestick charting may also be colorized to aid in an even easier understandable chart. 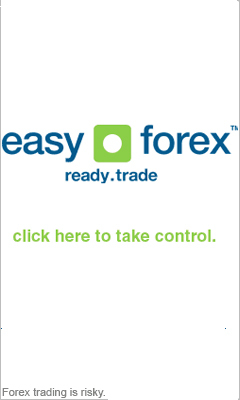 The currency foreign exchange Candlestick charting system can also be represented by candlesticks without either body or wick. White candlesticks – The candlestick is solid and not colored in - indicates uptrend price movement and the longer the body the more bullish the market. Black candlesticks– The candlestick is colored in black - indicating downtrend price movement and the longer the body, the more bearish the market. Complicated price movements can be expressed using the candlestick charting method with a combination of candlestick colors and features. We have introduced the concept behind FX trading Candlestick charting and has shown the origin, importance and basic positions of the candlestick chart. Foreign exchange Candlestick charting has proved itself as a trusted visual aid for recording and predicting Forex trading.